This is the highest grade TIZIP called the Superseal. Its rated for diving applications and is suitable for most drysuit applications. The TIZIP SuperSeal is a strong, durable, very forgiving zipper, which will hold up to 700 mbar air pressure in lab conditions. 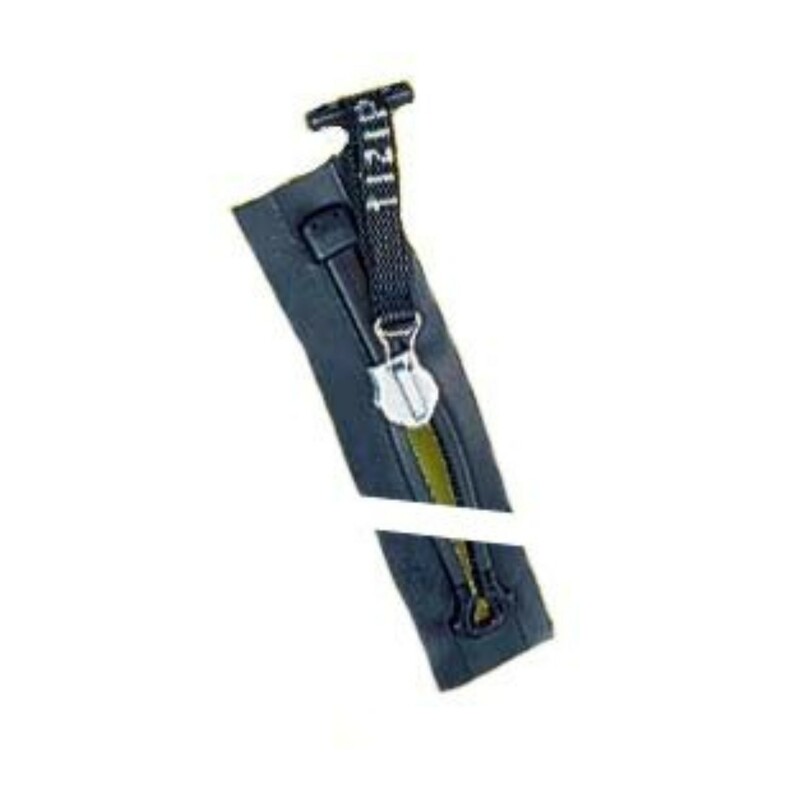 These attributes ideally qualify the SuperSeal zipper for use in diving drysuits. The TIZIP SuperSeal is made from a strong, plastic coil zipper on a high strength fabric. Every coil half is safely embedded and secured in a plastic profile. When the TIZIP SuperSeal is closed the sealing lips above and below the coil are compressed making a perfect seal. The entire plastic profile is highly abrasion resistant. The unique design prevents the slider from wearing down the sealing lips when the zipper is opened or closed. The physical design of the TIZIP SuperSeal increases the seal strength when the pressure is raised or when cross tension is applied. Both actions lead to an increased mechanical pressure on the top sealing lip. The sealing function of the TIZIP SuperSeal is tested by fastening the zipper in a straight rectangular frame, 3 cm wide, face down. Compressed air is applied to the front side of the zipper and water poured over the back until it is submersed. To pass the test no air bubbles may occur for a period of 20 seconds. Random testing is performed during the production of every batch. The TIZIP SuperSeal is highly resistant to damage caused by dirt or sand. However if dirt or sand are present, the zipper should be cleaned with soap and water. Dirt particles can affect the sealing function if they get caught between the chain profiles. If the TIZIP SuperSeal closure is used to protect life or sensitive material, the sealing function and cleanness of the chain area should be double checked prior to every usage. The TIZIP SuperSeal´s performance in terms of strength and durability is outstanding. It can take weight, it is abrasion resistant and it will survive short term sharp bending and twisting without separating. The SuperSeal construction is very different from the well known waterproof metal zippers. When bent, curved or twisted underwater the SuperSeal may allow a little water permeation. This is not a zipper malfunction or the beginning of an increasing problem. The amount of water permeation is never enough to harm the diver or make him feel uncomfortable. Provided installation and lubrication is done correctly, the SuperSeal zippers advantages of durability, forgiveness and wearing comfort speak in its favour. However if there is no tolerance in terms of water permeation a metal zipper is still superior.